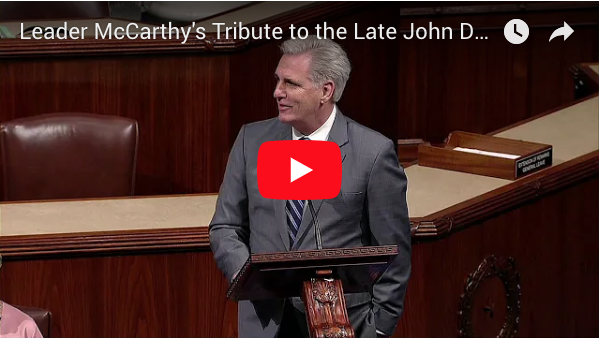 Washington, D.C. – House Republican Leader Kevin McCarthy (CA-23) honored John Dingell, the longest-serving member of the House in history, and his dedication to public service. “I also rise to commemorate the incredible life and career of John Dingell – the former Dean of this House. “Few individuals have amassed a record of public service that could rival John’s, and I will bet no one will ever match it – 59 years as an elected representative. “In fact, his interest in politics began during his time as a Congressional Page, where he personally witnessed FDR’s “A Day That Will Live in Infamy” Speech from this very podium. “Take one moment to think of the life that this man had witnessed on this floor. “John taught us that public service is not a sprint, but a marathon. There are many lessons in his life that we can learn from, but I hope we take that lesson every day when we come to work here. “Another lesson I hope we learn is the one of how I first met John. “He was an icon before I got here. But I watched the respect, not from his own colleagues in his own party, but the respect from across the aisle. “They went to John for advice. “When he walked on the floor, there was many on our side that stood around him – they’d question him where we thought we could go. He believed in this House. He believed in this country. “He had great passions – passions for his constituents, passion for his committee; energy and commerce. He loved this committee so much he thought there needed no other committee in this House. It wasn’t until his retirement that we got jurisdiction back in other places. “But he understood an ever-changing world, if you can only imagine serving that long. “He was able to adapt – which we should learn from too. Yes, the new world of social media, many would think would pass him by because of his age. But he was one of the first I would follow on Twitter. “This is a lesson this House, in a bipartisan manner, should take. It’s one of my favorite tweets from John. “Yes we are sad today, but he lived a life we can admire. “I may have difference in opinion and philosophy with him but I admired his will to fight for what he believed in. I admired the way he treated people who had different beliefs and I admired the way he believed all sides should be heard. “I speak for everyone on this side of the aisle to convey our deepest sympathies – and to Debbie.